Yes we have wonderful sun rises here too. It was a bit cloudy today but it did make for a wonderful sunrise. The clouds kept it cooler in the morning until they passed and wormed us all in the afternoon. At 8:00 I joined in to the daily walk as I do each day. I'm glad to have people to take a walk with and just enjoy the morning. 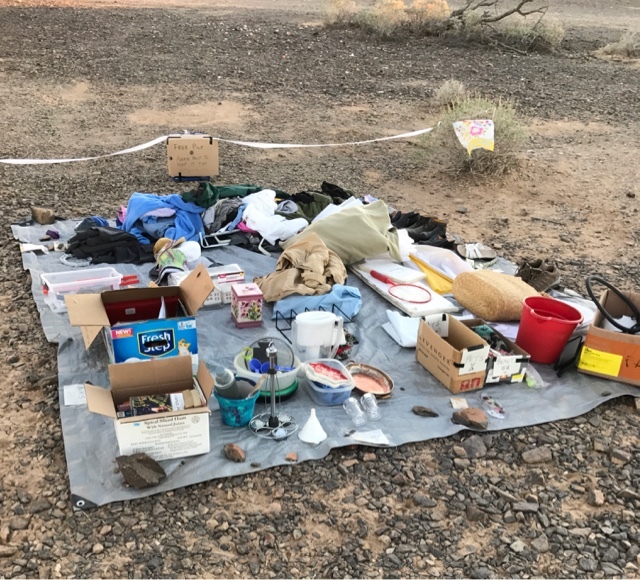 Upon coming back to camp I drove into Quartzsite to buy a tool to remove the interior door handle of a 1990's chevy van to see if I could fix the electric windows that are not fully working this afternoon. At 10:00 each morning there is a gathering of all interested and announcements are made, and people looking for help are mapped with people that have the ability. 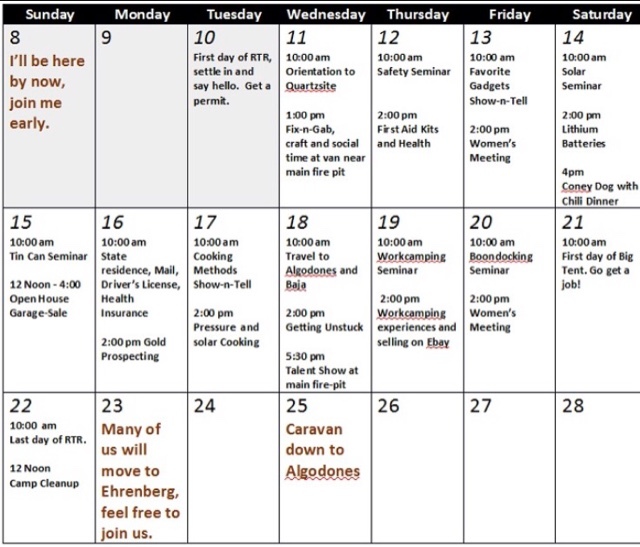 Right after the announcements there will be a seminar each day. 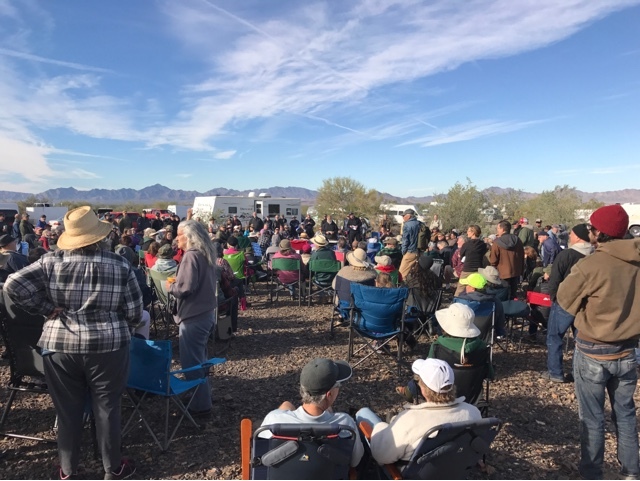 Today, Bob Wells, the group leader, covered things helpful to know about Quartzsite, including the dump days and hours, where to get packages delivered, where you can dump your holding tanks, take on fresh water and get propane. Today, to cover all this it took until 11:30. Here is the RTR schedule that was handed out. 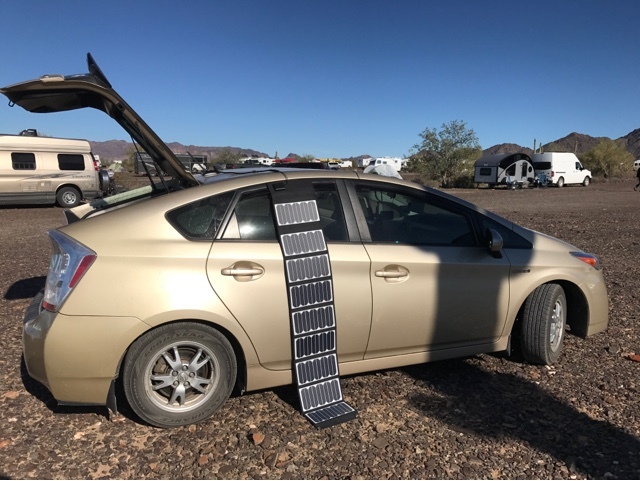 A solo woman who follows my blog waned a tour of my Prius, so we covered all the top features of my design, before I headed to help work on a friend's van with the part I bought this morning. It is nice to see the interest in what I have been publishing over the past few years of my Prius travels. 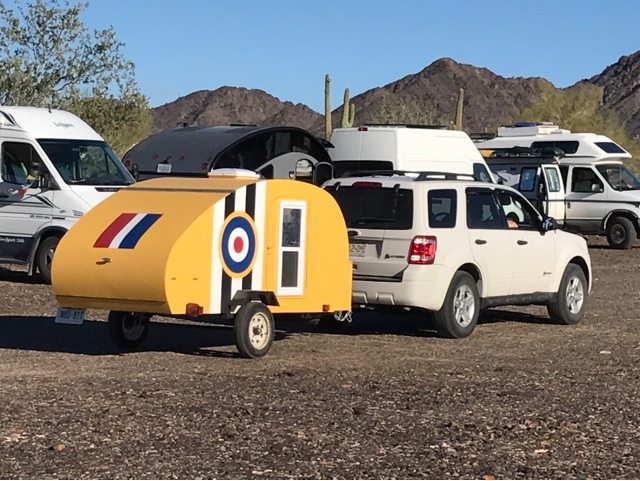 This is a nice little teardrop trailer that appears to be home made. Looks like a nice job. So brightly colored. There are so many different rigs here and lots of talent in builds and conversions. Unfortunately I was unable to fix the power window on my friend's van due to the older design. At least yesterday we got the power lock working on her side barn doors. 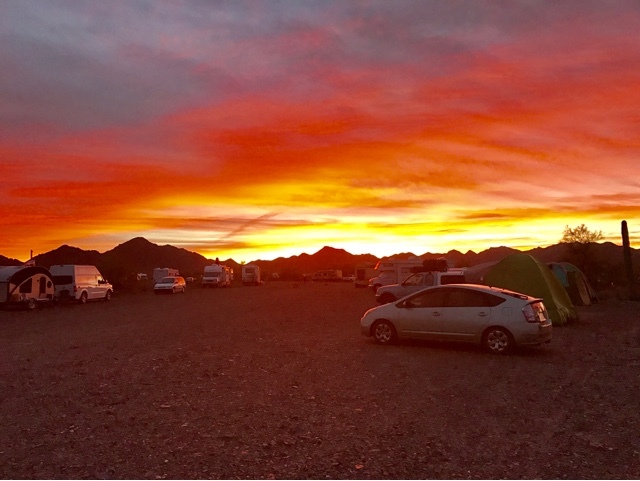 Above is how we vandwellers that are vehicle self contained hold our spot when we go into town as there are so many people still coming in. There are way more people than last year. 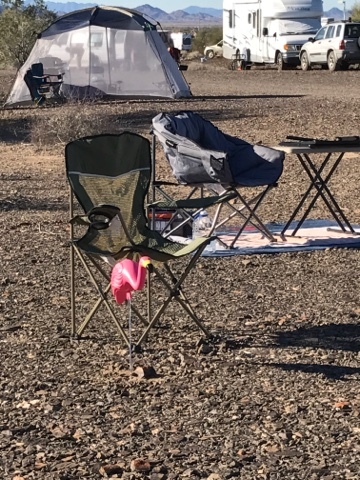 I had another solo woman vandweller come visit me, having seen my Prius setup online. She had a Prius but the drive battery failed before she left to come so she came in another vehicle. She wants to trace my platform designs and she is keen on the designing I do as her dad was an aeronautical engineer and she said he was always designing too. My designs are available to those interested but I don't have engineered drawings to share as I design and build and when it's done I have only sketches. This is the yearly swap pile. Things people don't want or need anymore go on and people come buy and take what they need. The plie ranges from books, to appliances, tools, and clothing. People stop by many times a day as the items are always rotating. 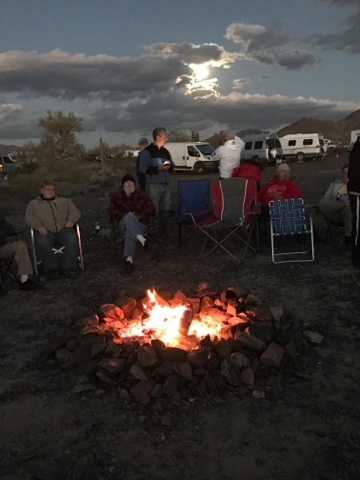 I stopped by the evening campfire with the nearly full moon rising in the background. There is usually someone talented to provide some music in the evening. 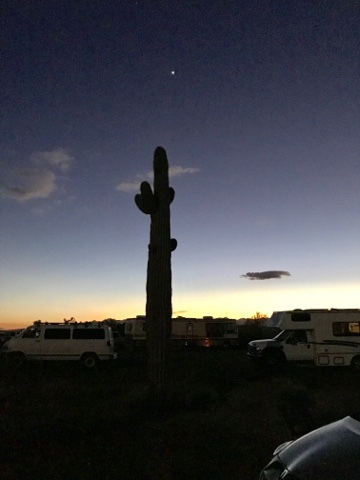 I headed back to my car where Venus was brightly shining above the saguaro I park next to. There was a new Prius arrival that had stopped to say HI and David with his green Prius and my with my gold Prius visited with yet another Prius dweller who came from MIssissippi. It was yet another busy day with about 10 visitors to my Prius to ask me questions. I am happy to share but missed either lunch or dinner being so Biosystems and only got time for a sandwich. I'm finally getting a chance to catch up! I really appreciate the day by day sharing! Thanks, My goal was to give an overview of the RTar initially but not chronical all the happenings as Bob's Vlog and others posts are doing that. Then I moved on to a mix of what I'm doing and some RTR.